For the first time in what feels like forever, the air in Provence was cool again. But a different kind of cool, an autumnal coolness. That kind of light crisp air that feels flirtatious. Ever since mid-June, the afternoons in in the South of France have been thick. The world moves slowly. It has to or you will die. The light is so bright I call it a blinding white and everything is bleached out to the point where all the colors that make this region so painterly are gone until the evening brings sweet relief. But today was different. I awoke to a chill. I drank my coffee in bed under the covers. I ran my morning errands, buying a baguette, some fresh eggs, these vintage glass treasures, the farmer’s daily delivery of seasonal fruits (plums today), in a linen blazer and scarf. But that light today… that French light was back. Angular and golden. No more darting from shady spot to shady spot, wondering why after two applications of deodorant it still seems as if you are wearing none at all, and being exhausted just from being … alive. It leaves you in a dizzying summer haze. I walked around town and felt the cool air on my cheeks. It’s amazing how just the change in weather can make your soul feel so many things. Today felt like new beginnings. I felt hopeful. The same way I felt last autumn when I arrived in France with so much to discover. The same way I felt when I first arrived in the autumn to New York City so many years ago. The way a perfume can take you back to a memory, that is what autumn’s air does to me. It takes me back to the excitement of new and all the possibilities are as endless as my dreams. Most of all though, I felt hopeful. 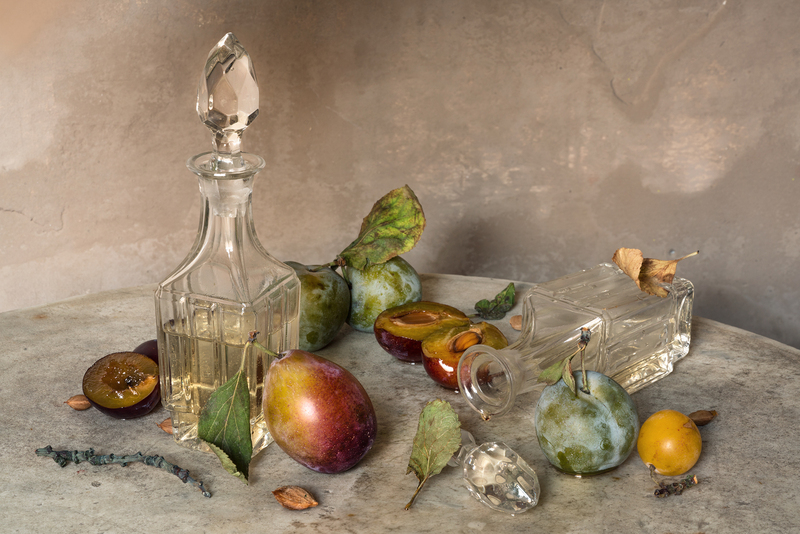 This still life is a representation of the cusp of summer and fall. The last of the summer fruits that have hit the markets, sun ripened plums in dusty hues of green, yellow and blushing berry. The leaves that will one day soon begin to turn. The white light becoming golden. The end of the nocturnal summer parties spilling way to what nature will bring tomorrow in the never-ending cycle that is the greatest gift of Provence.